The BT-7 (Bystrochodnij Tankov or “Fast Tank” type 7) was derived from the 1930 American-built Christie tank, which had been perfected and modified into the BT-2 and BT-5 series. These were pure cavalry tanks, designed for speed, with good armament but weak armor. First designed in 1935, the BT-7 prototypes had a characteristic canted-ellipse shaped turret, were of all-electric welded construction, with new Saslavsky brakes, new main clutch and slightly thicker armor. The tracks had a smaller pitch and fuel capacity was increased. Specifications asked that heavier guns should be mounted instead of the standard 20K model 1932/38 45 mm (1.77 in), namely the 75 mm (2.95 in) short barrel KT-26 and PS-3 howitzers for infantry support. The mantlet had a coaxial DT machine-gun and a rotating drum-type magazine for 18 rounds was stored in the rear basket. This complicated turret design was later dropped and the model BT-7 1935 was built using the BT-5 standard turret instead. This first series was equipped with an adapted version of the T-26 turret, shared with the BT-5. This had a 45 mm (1.77 in) 20K gun with a coaxial DT-model machine-gun. 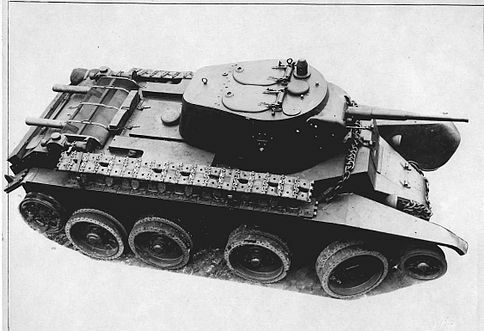 Commander tank variants had a 71-TC radio and a horseshoe shaped frame antenna. The crew of three was unchanged and virtually all other components were similar to the BT-5, most importantly the suspension, rubberized roadwheels, drive sprockets, idlers and tracks. The engine was also the same petrol radial Mikulin M-17T (V-12) derived from a licence-built BMW. Steering was performed with a control stick and the engine had three forward and one reverse gears. Command versions were the BT-7-1(U) and BT-7-1(V) with wrap-around “horseshoe” type frame antenna. The next step, which would become the main BT-7 sub-series, was started in 1937 at KhPZ (Kharkov). The most important feature was the new conical turret, derived from the T-26 model 1937, with horn periscopes. It was sloped and better protected, while storing more rounds (44) and having a rear basket niche-mounted DT machine-gun. Night fighting capabilities were rendered possible by the use of two special projector-type headlamps, and a mask was placed on the gun to decrease flashes. By 1938, improvements were made to the the gearbox, tracks, drive wheels and the night fighting equipment was retro-fitted on all models. The BT-7-2 1938 saw the installation of a gun sighting system, called TOS, developed by V. A. Pavlov and A. Z. Tumanov, to fire on the move more effectively. 1939 models received an additional bracing on the hull for extra strength, an escape hatch under the hull and a new air filter. The conical turret (nicknamed “Mickey Mouse” by the Germans, due to the appearance of the two round hatches in raised position) was upgraded along the same lines as the T-26 late turret. Production figures vary wildly, from 2700 to 4900 or even 5328 (without the BT-7 Artillery), according to various sources. The command version BT-7TU had a rod antenna and 71-TK radio set, and could carry up to 156 shells. This final evolution, sometimes called BT-7 model 1940, was born from the four experimental BT-8s. These were equipped with a new V12 diesel engine produced at the Voroshilovets factory and derived from the Hispano-Suiza 12Y aircraft engine. The BT-7M eventually showed a much higher endurance and overall range, and replaced the BT-7-2 on the production lines. They would become the ancestor of the T-34 family and were produced from 1939 to mid-1941, when the factory plants were dismantled to be relocated further east. Around 790 BT-7Ms were produced. 154 of these artillery support versions were produced, characterized by a bigger drum-shaped turret (adapted from the T-28), a capacity of 50 rounds of ammunition (without radio) and most importantly a KT short-barrel howitzer. These were produced from 1936 to 1938 and upgraded to the 1939 standard. Quite heavy, they were not able to run in wheeled mode. Diesel equipped BT-7, later incorporated into the similarly modified BT-7Ms. A howitzer version was tried, but never produced, the BT-8A. A specially-made commander version with a fixed turret. The flame-thrower variant, weighing 11.5 tons, was equipped with a side-mounted flame-projector. A counter-chemical warfare variant, used to disperse a gas in order to protect the infantry and lay masking smokescreens. SBT, a bridgelayer (no photos known), and the remote-operated tanks (for demolition) TTBT-7 and Thumbten-7, radio-controlled. 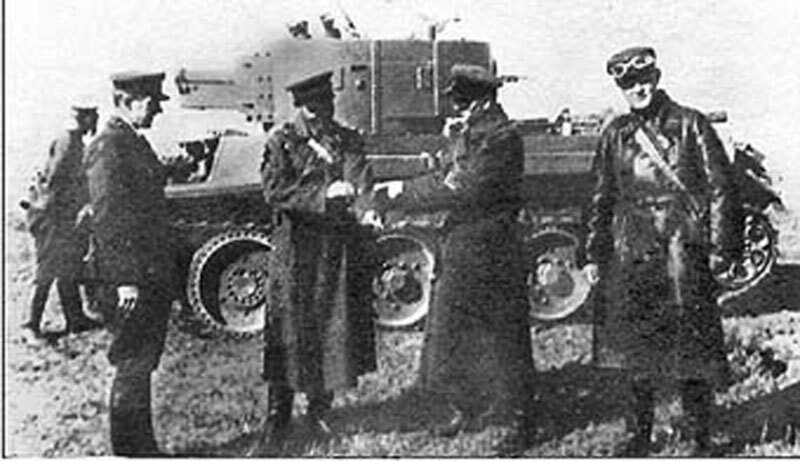 At an early point in their development, Giffard Le Quesne Martel (who pioneered the tankette concept) and General Wavell came to see the BT-7 prototypes on trials in 1935. Although not impressed by the quality of their hull construction, they were stunned by their displays of performance and eventually asked the War Office for a possible purchase. At their return in Great Britain, they pushed hard for the new Christie suspension to be adopted on the cruiser tanks. 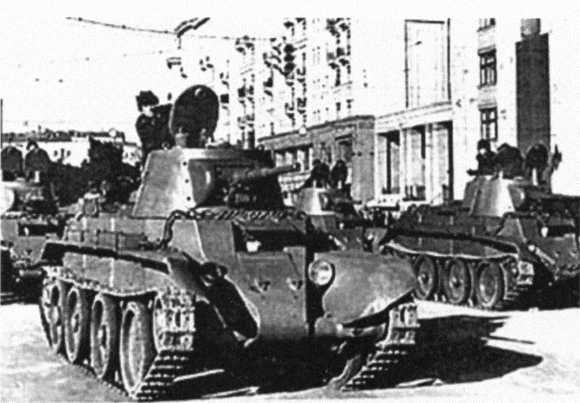 The BT-7 gradually replaced the older BT-2s, and their first wartime operations came with the borders incidents on the Mongolian/Chinese border. 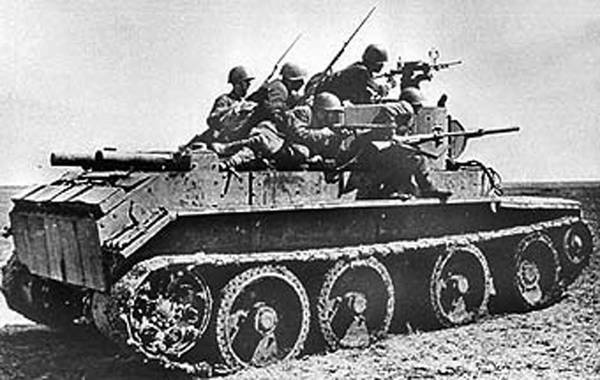 BT-7s equipped the 2nd Mechanized Brigade that confronted the Imperial Japanese Army at Lake Hasan in 1938. They saw heavy action (around 400 BT-7s) later at Kalkhin Gol from May to August 1939, with the 6th and 11th Tank Brigades. Their second assignment was the invasion of Poland in September, and the Winter War with Finland from December to mid-1940. 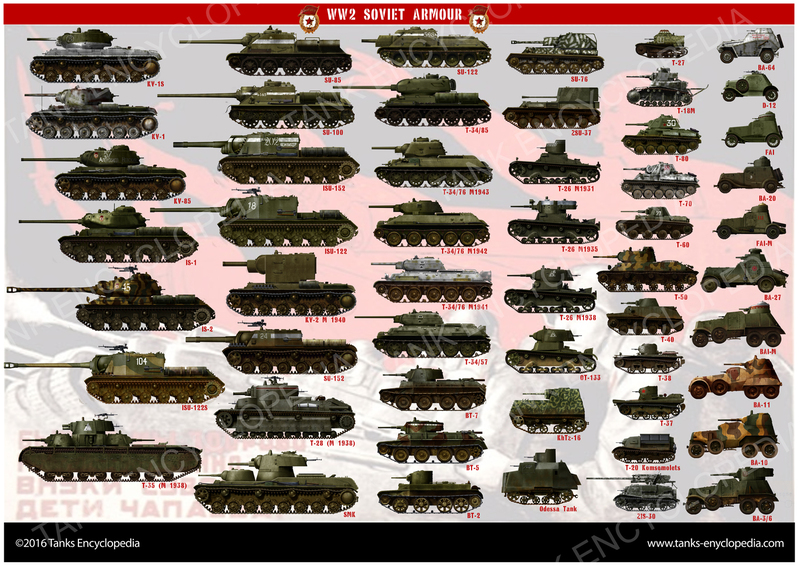 In 1939, each Soviet light tank brigade counted three tank companies, for a total of 17 BT-7s or T-26s and a reserve one (7 BT-7s). By the summer of 1941, the BT-7 found itself more capable to fight the German onslaught than the more numerous, but slower T-26. It was in effect the main battle tank of the Soviet Army. Losses were quite high, with an estimated 2000 lost due to enemy action or breakdowns in the first 12 months of Operation Barbarossa. In effect the attrition rate was enormous due to the excessive wear of the tanks, moved intensively from one place to another without appropriate maintenance or spare parts. All those abandoned and not sabotaged were later captured and integrated as Beutepanzers for auxiliary missions. 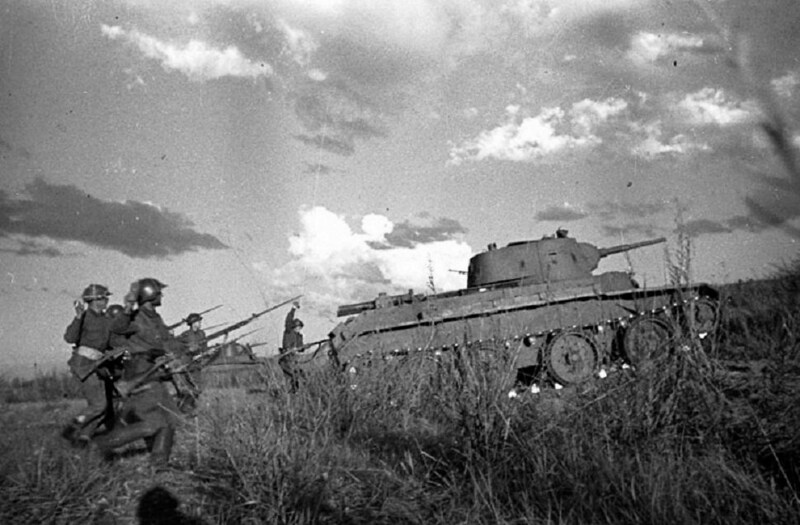 Surviving Soviet BT-7s, although replaced by the T-34, were engaged on every front until the end of the war. BT-7-1 or model 1935, with the T-26 model 1933 turret and extra protection, 1941. BT-7-1 command version with the horseshoe antenna and upgraded with night projectors. BT-7-2 or model 1938-39, late production, equipped with the T-26 model 1938 turret. BT-7 Artillery, an infantry support variant equipped with a modified T-28 turret and 75 mm (2.95 in) short barreled howitzer. BT-7-2 in winter camouflage, winter 1939. BT-7 model 1938, invasion of Iran, summer 1941. Captured Finnish BT-7, 1943. 56 had been captured during and after the Winter campaign of 1939, and 18 were converted as the BT-42. German Panzerkampfwagen BT 735(r), summer 1943. 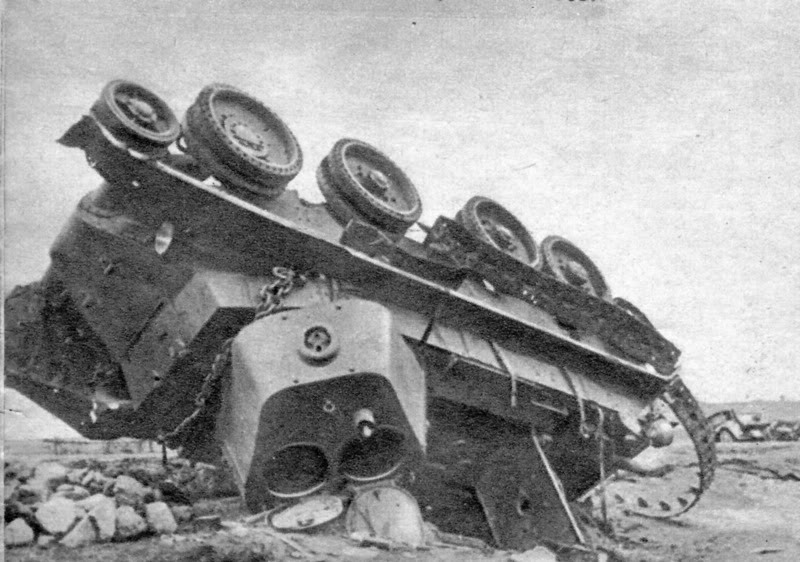 A BT-7 allegedly overturned by a SC 250 bomb from a Stuka ground attack plane in July 1941. I have thought of an all terrain vehicle, which swims and much safer than any vehicle available to the driving public. Where can I find a good set of drawings and information about the suspension system for road wheels and track modes. Hello Cliff, this might help you. If you have a look on the Steam website community pages for the (excellent) game Mius Front, on the Artwork tab you will find a video clip posted by one of the regulars who goes by the name of Guetapens of what looks like a BT-7 crossing a wooden bridge (I am posting a link below but maybe it won’t work(?)). The remarkable thing is that the bridge is no longer actually there, it is just driving across the thick wooden pillars that still remain. Maybe it is a well known clip (maybe you can add it here?) but anyway, it’s quite something. I can’t imagine it’s faked; what would be the point? It is not faked. a historical film clip exists. Filmed for the propaganda movie 1939 Tank Drivers, or “The Red Tanks” unofficially named.